AT&T has begun allowing out-of-contract customers to unlock their iPhone for use on other carriers, and the unlock codes are applied to the device after restoring through iTunes. AT&T began offering eligible customers the ability to unlock their iPhone on Sunday. Customers who were among the first to take advantage told AppleInsider that after dialing 611 to speak with a customer service representative, they were met with a lengthy wait to speak with a technician. Once that AT&T representative was on the phone, they asked a series of qualifying questions to ensure that the user was eligible for their iPhone to be unlocked. 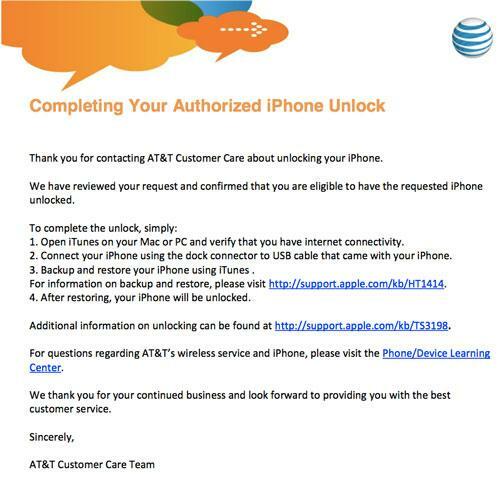 The unlock process is detailed by AT&T in a PDF document shared by users who request the service. In it, the carrier offers a series of four steps that must be accomplished in order to complete the unlock. The unlock code actually comes through Apple and is administered through iTunes. AT&T's instructions tell users to open iTunes on their Mac or PC, connect their iPhone via USB, and backup and restore their handset. Restoring the iPhone will unlock it for use on other carriers. AT&T's instructions also include a link to a support document available on Apple's website. There, users are instructed to reseat the SIM card in their iPhone, restore their handset, or contact their carrier if they experience issues with unlocking via iTunes. If the authorized unlock is completed successfully, users are met with the message: "Unlock Complete. Congratulations, your iPhone has been unlocked. To set up and sync this iPhone, click Continue."